The setup of Break 'Em All is well thought out (for the most part). It may take a little bit of playing around (about thirty seconds or so) to find the multiplayer, but other than that, everything goes smooth. Downloading is as quick and efficient as any game I've tried so far. For people who think this game seems familiar, feel free to look up Breakout, Arkanoid, Bananoid, or any one of over 60 games I was able to come up with after five minutes worth of research. What's the difference? This one uses the touch screen to drag the paddle around and you work your way up to the power-ups instead of catching them as they fall from blocks (as is the case in several other versions). The bosses are also not common for this style game and the same is true of Survival Mode. There are a few creative choices in the menus that could have been done differently. Putting a "Multiplayer" option on the main menu would be more understandable to a new player than requiring them to enter the modes before knowing what they are. "Tokoton Mode"? It would also have been nice to see "Host The Game" instead of "Host Player". 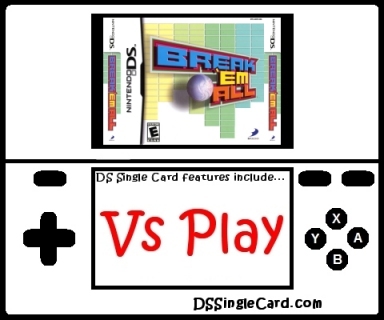 People familiar with the Nintendo DS in general, and people familiar with Single-Card Download specifically, will figure it out, but it's not the best way to win over newbies. Other than that, the menus are set up well. Most of the fields are large and have plenty of buffer space. In Quest Mode, the paddle responds well. When/where you drag it, it goes. Just make sure that you put the stylus where you want the paddle. The biggest flaw in the design of Quest Mode is the method of activating the power-ups. You almost have to use your thumb or a finger on your non-stylus hand to activate it when the ball is moving fast or you're likely to lose it. In Survival Mode, play was smooth and, as long as you're looking in the right place, everything works fine. It can be difficult to use the direction pad to change sectors while still using the stylus to move around within the sector, but it comes across as part of the challenge, which is probably how it was intended. The game's design is basic, which is appropriate. In Quest Mode, you're focused on where the ball is. In Survival Mode, you're focused on where the dozens of projectiles aren't. Distractions must be avoided at all cost. The game has background sound effects (which are appropriate) and music that's nothing special. Not bad, just nothing special. The game has two modes: Quest Mode and Survival Mode. Quest Mode is the game's traditional play of using a ball to break blocks. Survival Mode is, in one sense, an avoid-the-asteroid space survival sim. Very different games. Quest Mode gives you six either/or options. Survival Mode lets you choose one of four protective patterns. Not a lot of options, but nothing suffers because of it. This game fits into a unique gaming genre. It is, first and foremost, a puzzle game. Unlike other puzzle games, this one requires quick reflexes and reactions, putting it more into the action genre. Bosses are added, which makes it (in a very mild way), adventure. And all that is just Quest Mode. I have always enjoyed the basic concept of this game's predecessors because of its unique design in comparison to other puzzle games. This game was just made for a touch screen interface and, perhaps, eventually a Nintendo Wii version as well. This is a good game. Fix the power-up activation method in Quest Mode and change the menus and music nd you'll have (potentially) a great game. I use this game from time to time as demonstration of how a touch screen can change a game to improve it. Put a "Multiplayer" option on the main menu of the game. Make the power-ups in Quest mode more easily accessible. A change in music would be nice. Click here to return to the DSSingleCard.com Break 'Em All profile.